Those stovestop espresso makers that are found throughout Italy have long been on my list of kitchen items to buy, and that's just what I did a few days ago. I love an invigorating cappuccino or latte in the afternoons if I happen to be near a good cafe when I'm out and about. As much as I like a barista taking care of my coffee drink and making it to my specifications, creating one at home shouldn't be something to stop us from enjoying a good brew in our very own abode. After weighing the costs, manufacturers and ease of operation, I finally settled on the iconic Bialetti brand of espresso makers for my Pennsylvania kitchen. I just had to see what it was like. With several capacities available from this particular brand, I decided to go for the middle-tiered 6 cup version. Keep in mind that when talking about espresso, a cup of this brew equals to 3 ounces to be exact. That is a 'shot' in espresso parlance. A 6 cup stove top espresso maker will thus make 18 ounces of brewed liquid per batch. This is enough for a small group of people or for those of us who like to take at least a cup or two of latte or cappuccino. Automated espresso machines are de rigueur and very convenient to use at home, with those having one-use pods being the easiest to operate, but they are costly machines and professional ones can take up a lot of room in our kitchens. Leave it to the manual Bialetti Moka espresso coffee maker to help us make Italy's favorite coffee with a minimum of fuss. They have been manufacturing these little coffee makers for over 75 years. Now that I own one and have mastered the simplicity of its components, I will be reaching for it on a weekly basis to brew a little pick-me-up when I need it most. Keep in mind that the appliance is only part of making a good espresso. It's essential to have espresso beans that are roasted to perfection. The machine is made up of three components. The bottom chamber (on the left) is the water reservoir which has a threaded lip. Water levels are marked on the inside and it's important not to overfill it because it can cause too much pressure as the coffee brews. The middle part is the coffee filter which sits on top of the reservoir. The top portion of the espresso maker has a spigot where the coffee empties into the pitcher. Here's a photograph of how the water reservoir is marked. The line across one of the faceted sides shows you where its limit is. Before using the Bialetti for the first time, it's important to wash it in hot, soapy water. Dry it well. Fill the bottom chamber with cold water. Begin adding the espresso. This photograph shows you what NOT to do. Don't leave the chamber partly or half-way filled. If you do this, the pressure created by the water as it forces its way through this filter will cause the coffee to seep through the middle of the Moka maker. You want to fill it to the brim of the filter with espresso. Don't be tempted to tamp it down like you would in an electric espresso machine. Top it off and leave it alone. Screw on the top pitcher and set it on your stove top over medium heat. Whether you have an electric or gas range, it's important to set the narrow base of the Bialetti on the outer ring of the heat source (above). The handle of this espresso maker is plastic, so you don't want it over a flame. If you're having a straight espresso, there is nothing more you need to do but wait for the brew to finish. 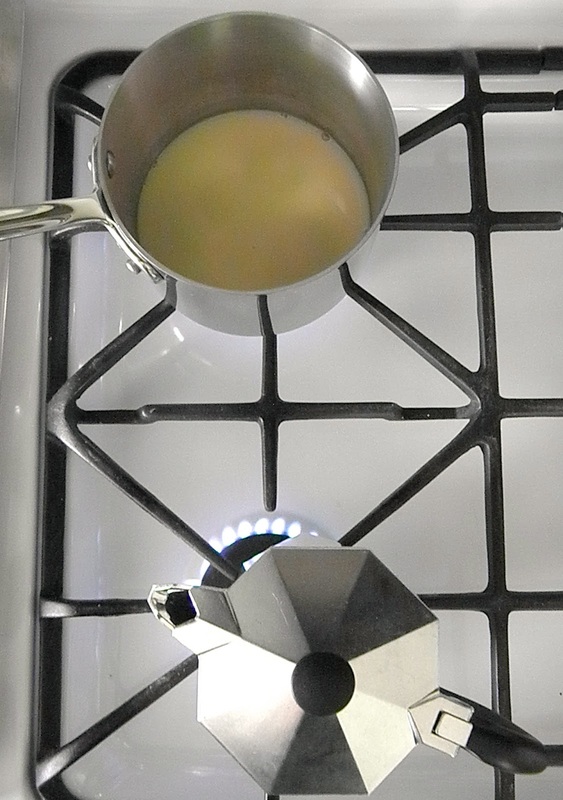 However, if you want a latte, cappuccino or macchiato, heat up some milk on another burner. When the hot water forces its way up through the filter in the middle, the espresso will shoot up the spigot and empty itself into the pitcher (above). You will hear it hissing through the spigot. A most delicious brew. When it stops coming through the spigot, the espresso is done. Turn off the heat source and set the espresso aside. Note: after you've finished pouring out the espresso, let the water chamber and the coffee reservoir cool enough for you to handle it before dismantling the espresso maker and cleaning it out. Hot soapy water and drying it thoroughly is all you need to keep it clean. This coffee maker is NOT dishwasher safe. These frothing wands make quick work of frothing up milk and I love how easy they are to use. The milk in this saucepan foamed up in a matter of seconds. Done! A cappuccino with a freshly baked banana chocolate chip cookie set on Wedgwood drabware is just the thing to have on a lazy Sunday afternoon as you read the newspaper. If I'm alone and no one is looking, I devour the foam before enjoying the espresso drink. Don't do this in front of company! Delicious. The thought that this inexpensive stove top espresso maker can make a weekend so enjoyable is worth having one in the kitchen. I guarantee that they won't break the bank and you will be able to use it for years and years. The Bialetti Moka espresso maker is now one of my favorite things ever. I am not a coffee drinker, but my hubby who is has a similar machine to this and he loves it. Watch out for the rubber gasket on the base of the pitcher part as they need to be seated properly or you will get steam leaking out the side. Hope you have lots of coffee fun. I am not a coffee drinker but honestly, your description of this espresso maker and your (always) lovely photos has almost converted this die-hard tea drinker to espresso! By the way, I won a Keurig coffee maker today through one of the blogs I follow! How funny is that?! You won a Keurig coffeemaker??? You don't even drink any form of Java!!!!! I have always looked at these types of espresso makers, but never purchased one. I have so many other coffee "machines" in the kitchen... but I may have to make the purchase! There's nothing better (in my book) than a good, good, cup of coffee or other java inspired beverage!